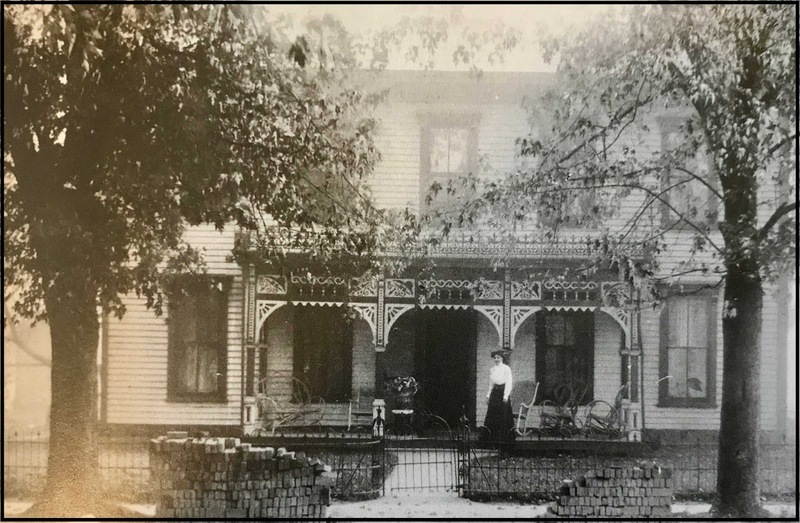 In the second segment of Sarah Eva Howe's "Book of Recollections," we join Sarah at 5th and Seminary as she continues to take us from house to house, family to family, remembering Carrollton, Kentucky, circa 1890. This may be as close to a replacement as we're likely to find for the missing 1890 census of the town. 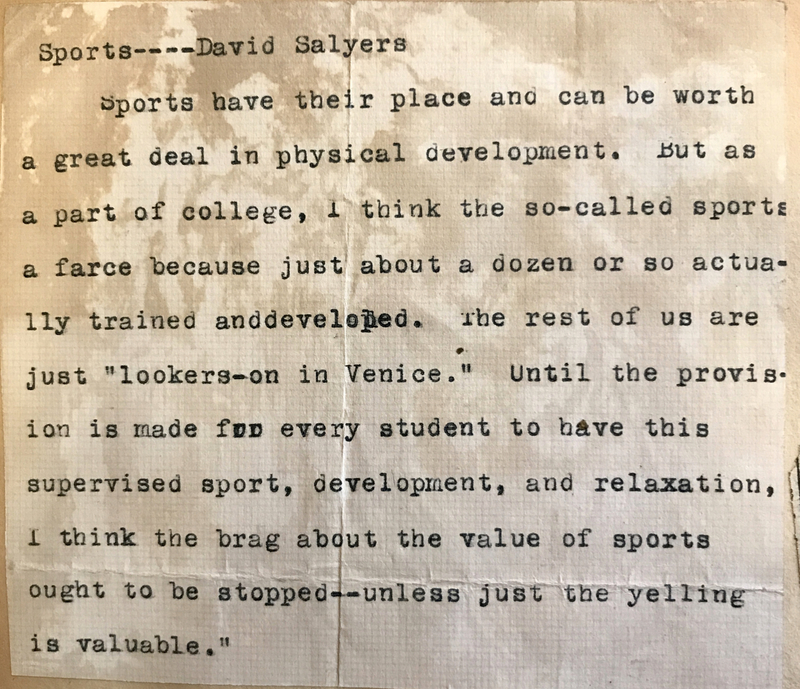 As I transcribe this journal written by Sarah in 1943, I want to stay faithful to her writing – even her long, convoluted sentences full of parenthetical phrases. However, because Sarah was writing to her own grown-and-married daughter, she felt free to "tell it like it is" – or was – according to her own memory. A few stories about her neighbors are unflattering. While I have the right to publish info and images from Sarah's scrapbooks and journals, I don't have the right – or desire – to publish anything that could cause hurt or shame among living descendants. After all, without proof, these stories are merely gossip. Throughout this series of posts, I will indicate omissions with an ellipsis, a series of periods. If you read something about your own ancestor and want the omitted information, please email me so we can discuss it. My email address is under the "About" tab. And now, on with Sarah's virtual stroll through Carrollton. As always, my own comments are in brackets. All parentheses are Sarah's own. From 5th Street on, there were no houses on Seminary that I know of until almost 1894 or 5, when the little brick on the corner was built, probably for Pearce Winslow and Maynie (Bond), his wife, for they were living there when Pearce ... left her. Just in passing, isn’t it sad and strange that of the three most prominent families then in the Methodist Church, not a great-grandson of the names survives. Mr. Will Winslow’s son died, so did the child1 Maynie bore Pearce after he left her; Mr. Henry Winslow left a son, Cooper, who never married. Mr. George [and] Mr. Jim left no children — the girls of course, as Aunt Lou, had sons of different family names. Of the Howes, you know of course, Papa’s son2 died, Uncle Joe’s boys3 had no children, Aunt Sallie’s son4 is a Froman, my children are Salyers5; Uncle John’s baby died, Aunt Lou’s and Uncle Will’s boys6 had no sons. 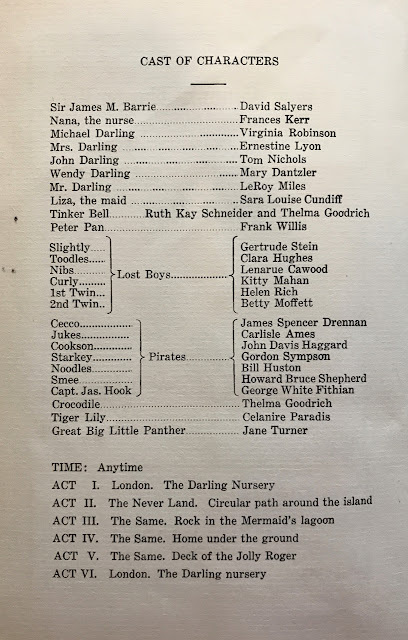 Of the Conns, the daughters had sons of different names, of course, and even in the Rowland family, with three sons, there was not a son born to any – only to one girl in the family, Louise, who married Harry Stringfellow. Looking around at all the multitude of babies I see, I think it isn’t fair somehow that there is not a Howe, a Conn, or a Winslow left of the old families by name among the youngest generation. at 219 5th St. The first resident was the Reverend J.D. Redd. But to go back to geography? topography? — I am going to skip down 4th Street, on which no one lived that I remember except the Thoma family — he was the harness maker, and his wife was so pretty. They had three boys and a girl. I’m not sure they were living in the house they now occupy (Mrs. Thoma). In fact I believe they bought it later, but they lived there in 1903, I know, or about the time Mabel graduated and married Charlie Griffith. The Schuermans had moved to Carrollton about 1884, almost the time Mama came to live at Grandma Howe’s7 home for a year, when I was little, for Aunt Sallie Howe, as well as several other girls, had quite fallen for Henry, who had a certain rough masculine charm, though a German ruthlessness with his employees (however, he was an impulsive, kindly fellow at heart, good to his family and the best of the three boys). 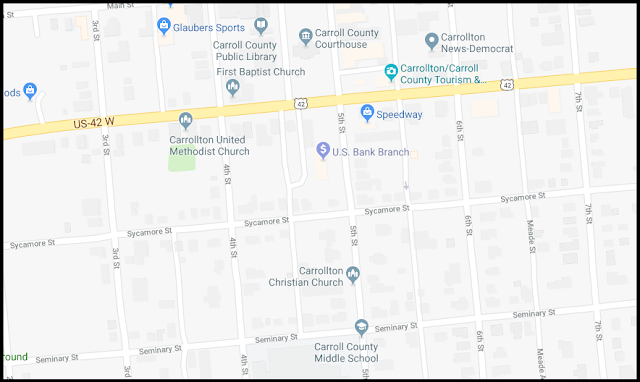 About the time we came to Carrollton, he had won the heart of Ruth Winslow, tho the great opposition of her mother, who however afterwards was devoted to him. Will Schuerman had married Julia Berg, and their first child8 was born late in 1890, I think. Julia had a brother, Bob Berg, but he never made much history except as a hard drinker, like Jim Winslow who was, however, of a far superior intellect and amiability. I suppose the Schuermans lived where Miss Hattie did, but they rebuilt the house several times or fixed it over. Oh, I forgot! In the brick house where cousin Ruth and Henry [Schuerman] lived afterwards, Mr. James Lowe was living when we went there; he was an Englishman or Canadian, I forget which, but I remember him, a quiet, small, oldish man. His much younger half-sister9 lived down near Grandpa Howe, and I played with the two boys Jim and Charlie, when I was living at Uncle Joe’s. 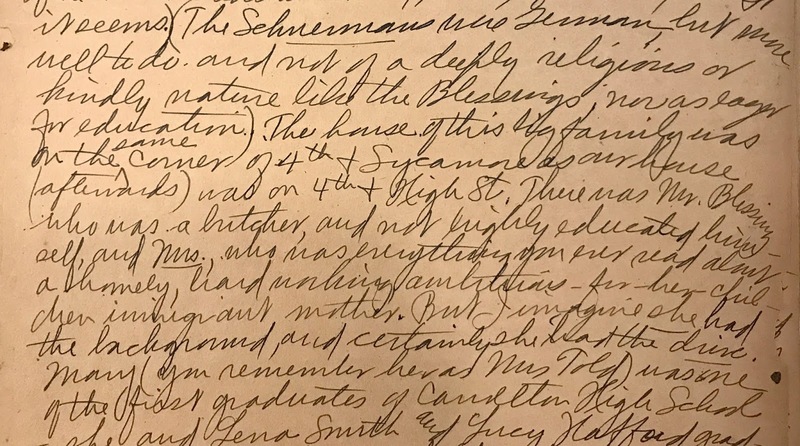 Now, coming from Seminary to Sycamore on Fourth St., across from the Schuerman house lived the Blessings, a remarkable German family of the most creditable kind (alas, almost extinct, it seems). The Schuermans were German but more well to do and not of a deeply religious or kindly nature like the Blessings, nor as eager for education. The house of this big family was on the same corner of 4th & Sycamore as our house (afterwards) was on 4th & High St. There was Mr. Blessing, who was a butcher and not highly educated himself, and Mrs., who was everything you ever read about a homely, hard working, ambitious-for-her-children immigrant mother. But I imagine she had a background, and certainly she had the drive. Mary (you remember her as Mrs. Told) was one of the first graduates of Carrollton High School –- she and Lena Smith and Lucy Wafford graduated together in exercises held at the 6th St. Schoolhouse in 1890, I believe, or thereabouts; Mr. Weaver was the principal, tho he left and Mr. Melcher came in the year I started to school (the fall of 1890; I may be a trifle off in these dates, but I can verify them later. The three graduation addresses were Mary’s in German, Lena’s in Latin, and Lucy’s in English. 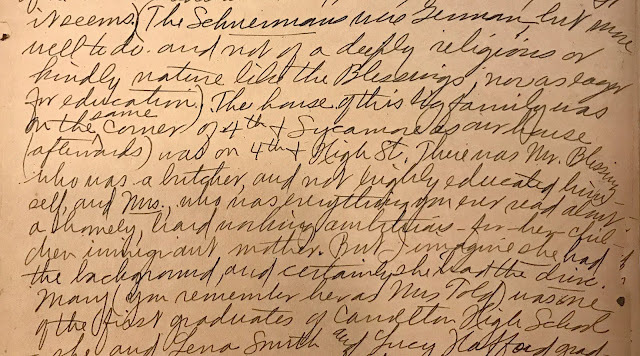 A portion of Sarah's writing about the Blessing family, who lived at 4th & Sycamore in the 1890s. The oldest Blessing son went on to college, was a Kappa Sig and I believe a Ph.D.; he was a very outstanding boy — went to Swarthmore, I think. George, his name was. Mary married Mr. Told of Vevay; he came from a pretty good family — his brother’s daughter, Mabel Told, used to visit them and she was a very attractive and [a] child who could both recite and sing — one of those “infant prodigies” of the 90s. (Sallie Howe [the writer herself] was rather considered on the verge of one but I am thankful to say lacked some of the characteristics). . . . [The information is ambiguous here; apparently, Mr. Told left the family after three children were born.] Mary raised them (very creditably for the material at hand) and worked for years at Howe’s Store10 to support them. The second son graduated with John Howe11 and went to “State College”12 with Lewis Darling. I imagine he, too, was a Kappa Sig, for Lewis was. 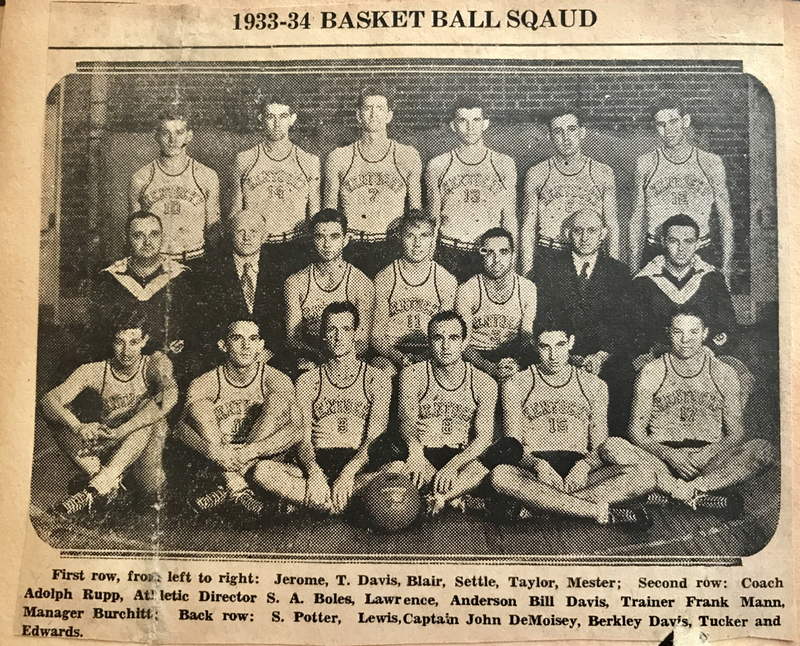 His name was Charlie Blessing; he was one of the “Dirty Dozen” with your Uncle Bob Salyers13, cousin John Howe11, Charlie and Oscar Kipping, and Allen Gullion and Frank Grace. Then it seemed the rest were not so outstanding — there were two deaf & dumb children, Lily and Violet (you remember Lilly; she was very smart, worked for years at the store). Both attended the Deaf Mute Institute, and Violet married another boy who went to school there. Clarence and Rose were around my age (Rose a little older), and Clarence was not as smart as the other boys. Rose was bright, but not like Mary. She married a Craft and taught school for years at Hindman. 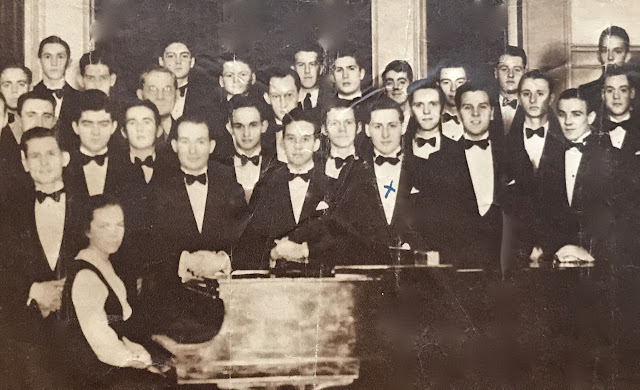 The youngest boy was called Bolivar Buckner [Blessing], or "BBB" by most of the children, and there was another boy, Paul, a little older, rather effeminate, who was quite talented in music (but not a genius) and also, strangely enough, a fine mathematician, quite a wizard at it. He taught it afterwards at school somewhere. But the truth was that after the first four or five children came, they shouldn’t have had the others, for they had neither the health themselves or money for the education of the last ones. Buckner just ran wild, tho I believe he afterwards did very well when his brother George took him after the death of his parents. seen on the streets of our fair city, it was said. (She was good-looking, too, and Elinor, their daughter, was a real beauty; she was Leonora’s age.) The other, Annie, married a brother of Laurence Grobmeier14 of the family of which I told you earlier. (You remember their children Osmond[?] and Florian Grobmyer, I’m sure.) 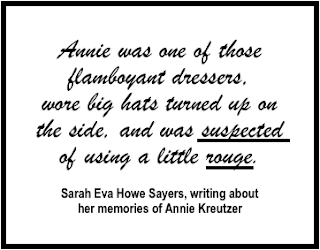 Annie was one of those flamboyant dressers, wore big hats turned up on the side, and was suspected of using a little rouge. A queer combination made up the people who lived on the left on Sycamore (as you went down 4th to High). In a tiny frame cottage lived old Mrs. Rhodenbach, an aunt, I believe, of Mrs. Glauber, Bertha’s mother (those early Catholic families are hard to untangle as to relationship). She had a daughter who married an Irishman named Donnelly and had the boy I mentioned, Eddie, and two daughters, Maggie, who lived with us when Leonora was born (Mrs. Weismiller next to Miss Rose’s, you remember) and Katie, who married Ernest Lawrence. Next to the Schonlows (a step down an alley, but almost on the same street) lived the Washingtons, of color, with a whole family of children. These two houses were back of the church. On summer evenings we could sit in our back yard (at 4th & High) and see the Washingtons disporting themselves in their back yard, with enough distance to make it a lovely picture of the old south and Stephen Foster.16 The littlest girl, Mesie, was a perfect little “topsy.” The old grandmother, a good old woman, who lived with them, fell down the steep back steps and broke her neck, but we weren’t looking over at the time. Alec was the name of the father. I’m hazy about the other side of the street of that square. Of course, no one lived on 4th St. between Sycamore and High St. because those wonderful gardens stretched down from the houses on each street corner to a little stream which ran through a kind of culvert at the very depth of the little valley where the line fence ran. (When the “backwaters” came up, this filled out into a sizable stream.) And by the way, before leaving this part of town I find I didn’t mention the youngest Schonlow girl, Elizabeth, who married Ed Hill, the dairyman, and died with her second child, I believe. She was a very nice girl, too. His first wife was Laura Glauber, and of her family I will tell when we get to upper Sixth St. beyond Seminary, and there we might as well go after slipping out Fifth Street from High, first (and now we are getting down into where I lived). Leaving the Winslow and Donaldson homes to be described with High Street, Aunt Lou and Uncle Will6 lived at the same house then that Aunt Lou has lived in all her married life, but of course the place where the parsonage and the Robertson house and the one next to it are now was just their side yard and pasture, where we played many a happy hour. I don’t know who lived in the gray brick across the street, but the Goslees moved in there about 1891 (but when I first went to Mildred’s house, they were living on Main Street). 1The first child, as far as I know, was unnamed and died shortly after birth. The second child, William Beverly Winslow, died in 1907 at age 6. Several Winslow families gave their children the name William Beverly, honoring the ancestor of that name who lived in Carrollton from 1814 to 1883. The mention of "Aunt Lou" refers to daughter Louisiana Winslow (1852-1944),who married Sarah's uncle William Ficklin Howe (1846-1916). 2Chandler Howe, Sarah's brother, who died 10 Nov 1889 at age 19 months. 6Sarah's paternal uncle William Ficklin Howe and wife Louisiana "Lou" Winslow Howe had two sons, Winslow B. Howe and John Junior Howe. 7Reference to Alice Ada Cost Howe, who was Sarah's mother and her children's grandmother. 9Sarah later corrects this relationship to step-daughter. 14Possibly Grobmeyer; Sarah wrote one, then wrote the other over it. 15Sarah wrote that this family had several sons and three daughters, but she named only Rudy, Annie, Mamie [or Marnie? ], and Elizabeth. 16This paragraph reveals attitudes of that time period. We can't change history. 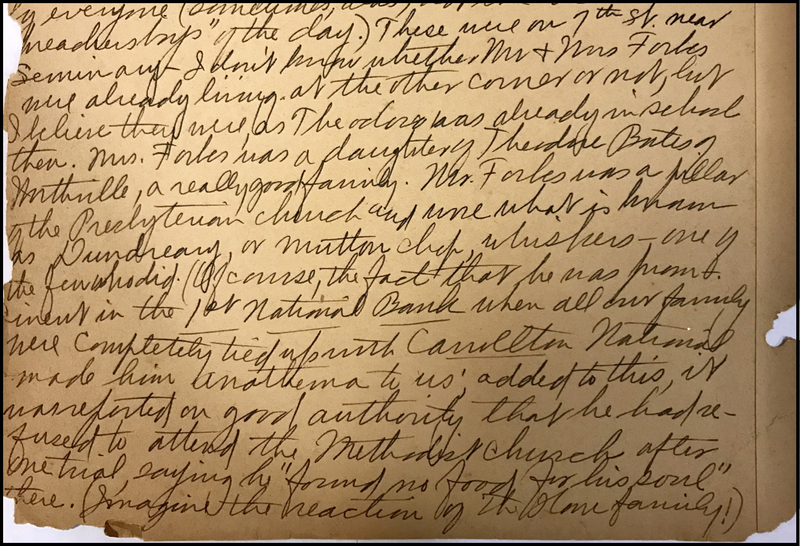 A Howe-Salyers descendant in Iowa recently found a treasure: dozens of loose pages full of Sarah Eva Howe's handwritten memories of 1890s Carrollton — landmarks, people, events. Sarah wrote this "Book of Recollections" (as she titled it) in the 1940s, beginning with her memories of 1890, when she was about 6 years old – the age she is in the photo below. 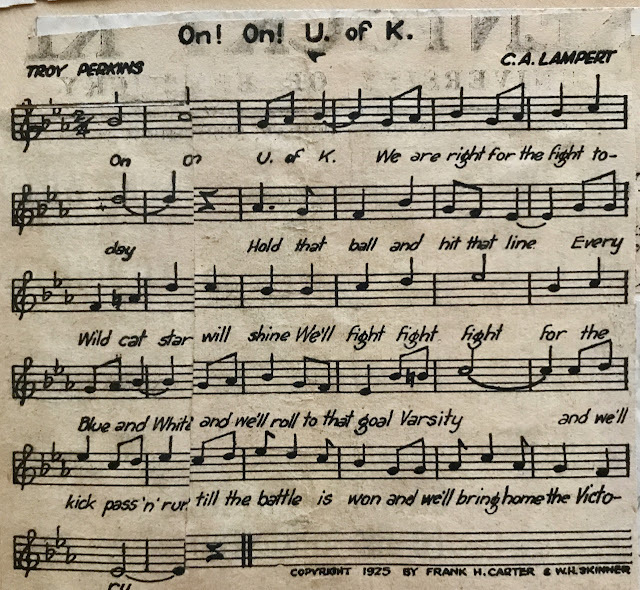 This post begins a series that includes transcriptions of those pages. Be warned. Sarah is not always kind in her descriptions of folks she remembers, and she recalls attitudes that are considered inappropriate today. Please consider that my disclaimer. My clarifications of meaning and my uncertainties about interpreting her handwriting are noted in brackets. Seminary boasted few homes. I suppose Capt. Adcock’s was there, tho the family only swam into my ken when I remember “Daisy” as being in the 8th Grade, tho I heard Mildred mention “Aunt Leotah” and “Uncle Anson,” and I knew the latter at our church and in the drug store (Miss Sue’s brother, he was) and of course they lived there. The big house across the street, facing on 7th St., I forget who lived there, but the house next to it, afterwards Kirby’s, was our Methodist parsonage, considered really preposterously far from the church in those days when the parsonage was supposed to be next door. I think the Ginns lived next door even then. Mr. James Ginn was a ... politician, Democrat of course, tho Harrison was President when we went there — the county politics were Democratic. I think Mr. Ginn was county clerk for a long time. Mrs. Ginn was quite a prominent worker in temperance societies, which were soon quite a feature of our life. They had two boys, Bob and Earl. Bob was studying either medicine or dentistry — I remember hearing them say nobody would think of having him, he was too young, tho he was called “Doctor.” Earl I knew real well later, tho he was at least 5 years older than I. 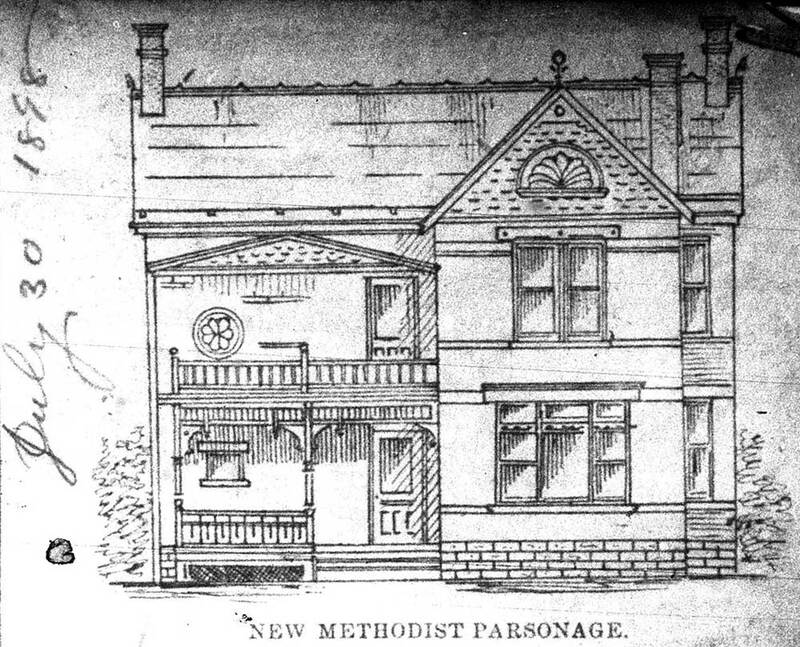 The Methodist minister at the time was Brother Nugent, from Mississippi, a fine pastor but not an interesting pastor; his wife and he both had lovely Southern accents; she seemed greatly his inferior in character, being very “gossipy,” of which more “anon.” They had one boy, Clarence (“J.C.”), who was indeed a splendid fellow and well liked by everyone (sometimes, alas, not the case with “preacher’s boys” of the day). ... a story told of him by Miss Lou Sanders. When they were together in the first grade, he gave her a card on which he had written “Be my Valentine” (she says it took her years to realize why he didn’t buy a real one or put a stamp on it as most of the other boys did). Coming down to 6th Street (I believe there was only one house between, afterwards occupied by Miss Carrie Moreland, who lived there when she died by burning with splashed gasoline) on the corner was the low, long house occupied by the Gullions — who were the current editors of the Carrollton Democrat. 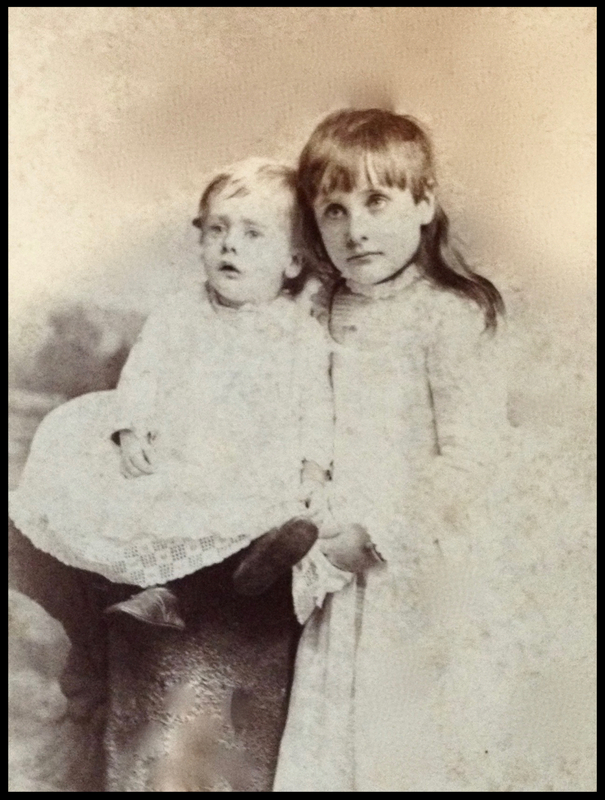 (Their entrance was on 6th St.) They had three boys: Allen, a very precocious, bright boy four years older than I, Carroll, one year older, and Walter, almost a year old in 1890. Mrs. Gullion was such a wonderful, outstanding woman that she deserves a page or two all for herself, and I shall have it later. This was Mr. Ed Gullion, and Mrs. Gullion was a Hanks, of the famous Kentucky family, and especially the Carroll County branch. All of them were all members of the Christian Church. Mr. Gullion’s father, from “the Ould Sod,” was Wyant O’Gullion (Allen’s middle name was Wyant.) Ed Gullion’s brother Emmett was a fervent Methodist and longtime member of our church. He lived farther out 6th Street ... His wife was a Campbell, from a prominent Northern Kentucky family. She had a sister who was almost a dwarf, who lived with her, a great wonderment to us children; the two daughters, Mildred and the baby Louise, were raised in the “faith” of their mother, Baptist. Indeed, the church lines were so sharply drawn that some spoke with regret of “mixed marriages” between Baptists and Methodists, and indeed it did often cause family quarrels and dissension. As to the few Protestant-Catholic marriages, these were considered real tragedies. One such marriage, however, was managed with some skill — simply by the husband announcing that all his children were to be raised in the Methodist church — and sticking to it. This was the family that lived catercorner on 6th Street (2nd from the corner) from the Ed Gullions — Fred Kipping and his wife, who had, when we moved there, two grown sons, both married, and two married daughters and two small sons, one six years, the other four years older than I — Charlie [Kipping] and Oscar Geier [Kipping], named for his cousin, the young druggist of M.A. Geier and Company. These all were faithful attendants, with their father, of our church — their placid Catholic, sunny-faced mother (Miss Kraut[?] from Madison, she was the aunt of Mrs. [?] in Lexington) seemingly never protested (no use anyway). Across from the Kippings lived the Pryor girls and their mother in a rambling old frame house. They were the wife and daughters of a famous Civil War fighter (Confederate, of course). I don’t know of any house then built between 6th and 5th, but on the corner of 5th was the old low brick occupied by the Bergs, the old jeweler, his wife and two daughters, Julia and Tillie. Julia married (by 1890) Will Schuerman, and Tillie (the older, I believe) [married] one of the Dean boys, cousins of Miss Sue Browinski, and they lived out in the country on the Dean place, near Dean’s Woods, where we had the Sunday school picnics, now all a part of Butler Park. I think the Grobmyers were living in the big house on the corner then, and over on the other side the old Seminary took up the whole square. When we went there in 1890 it was a ghost school, the whole student body, high school and all, having been moved out to the new 6th St. one. The big yard, surrounded by a high iron fence, was used to pasture cows and for different kinds of ball games and children’s antics. The old frame house on the corner opposite Grobmyer’s I have no remembrance of, but I know it must have been there, with some one we knew living in it; there was no house between it and the Christian Church (newly built) on 5th St.
Across from that church was the small brick occupied by Mrs. Grobmeier (they were cousins of Cass and Ed but spelled their name differently). It was this family (one of the boys was Arthur’s father and married Miss Katie Seppenfeld) and one [boy named Tim?] married Emma Brink and was Jeannette’s father. . . . This Mrs. Grobmeier was washing for the Seppenfelds when [some in the Seppenfeld family] took smallpox in the early '80s. Mrs. S. didn’t tell Mrs. G. about the illness but sent the bedclothes to her to wash as usual. Two Grobmeier children [caught smallpox and] died; the others also had it. For that reason Mrs. G. held out for years against the marriage of her son and Miss Katie. There was a baby of the family, Laurence, who went to school with me for several years, tho he was several years older. In those days the Catholic school children — after confirmation — came over to the “White school,” as they sometimes unthinkingly echoed the joking name given it by the Protestants. They were several years behind the corresponding grade generally, and I can still see the eager, obedient, slightly dull big boys and a few larger girls, in among our small fry in the 4th and 5th grades: George Abel (the twins’ father), Laurence, Eddie Donnely (Maggie’s brother) and others. Also we had large children from the country schools, who sometimes started in the spring after their terms ended in February. Stella Carrico, who I am sure was Paul’s aunt or near relative, was in the second grade with me. 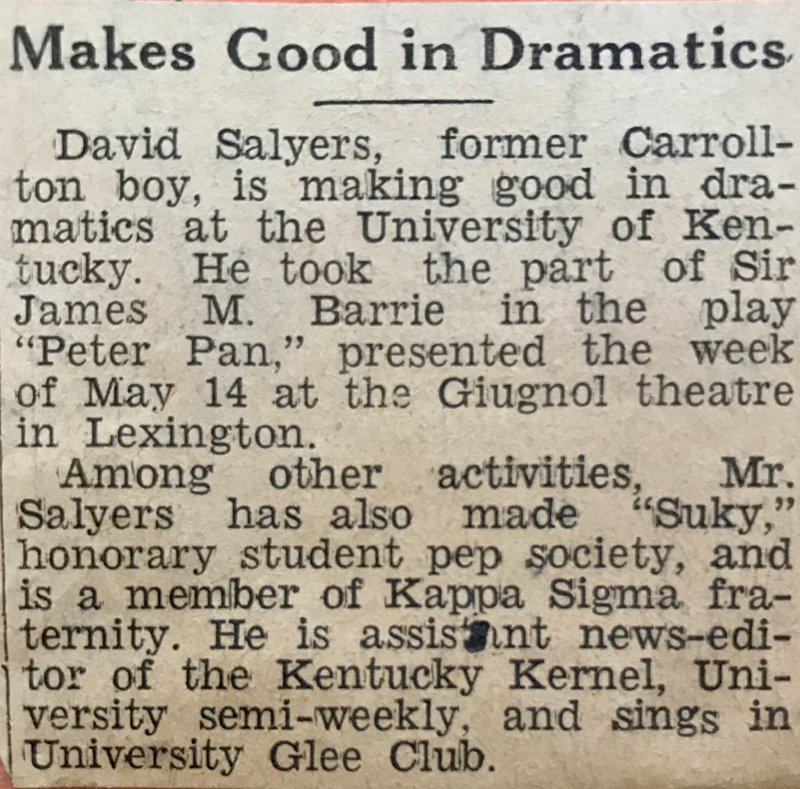 David Hillis Salyers II, the youngest child of Will and Sarah Eva Howe Salyers, made quite a name for himself at Henry Clay High in Lexington. He must have been a "Big Man on Campus" in high school by the time he graduated in 1933. 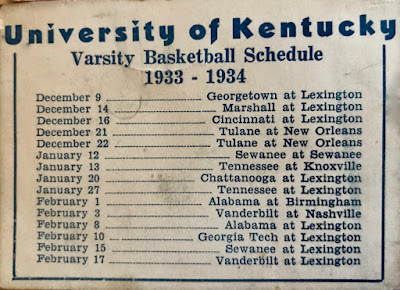 That fall he enrolled at the University of Kentucky. In those days, the college freshman year was steeped in traditions and rules that were intended, I thought, to put freshmen in their place – to deliver what my grandmother called a "considerable comeuppance" to new students who arrived from high school full of self-confidence and senior sensibilities. Apparently, I was wrong about that. 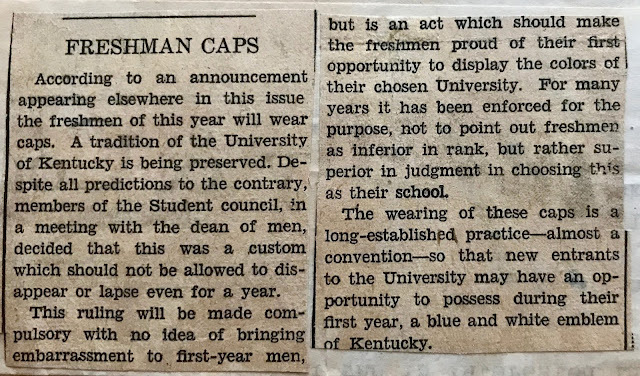 Freshmen apparently basked in those traditions and rules. 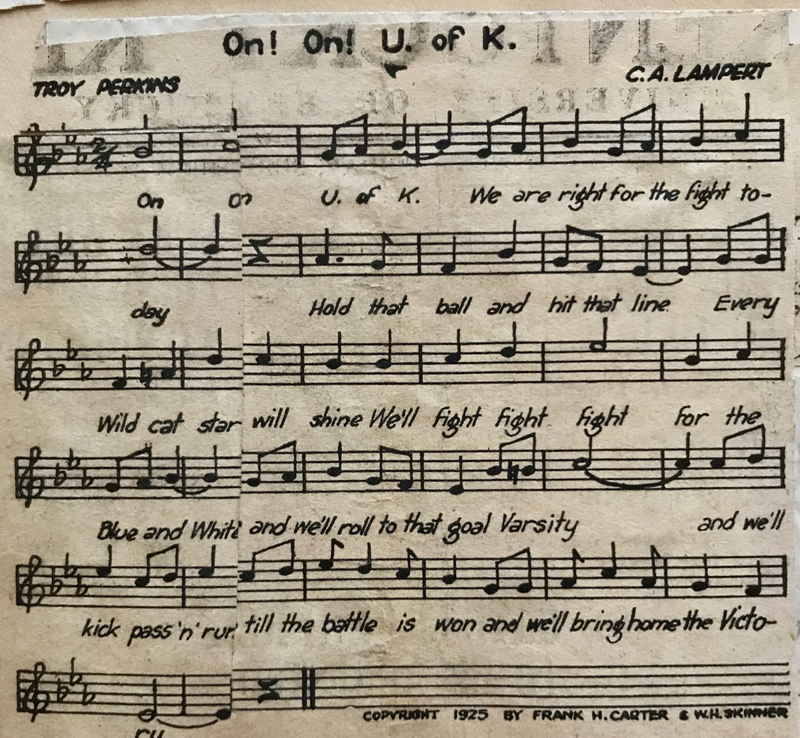 For example, each freshman had to learn the college song, written just eight years before David started college. David has just finished his fifth week at U of K and is quite a seasoned freshman now. 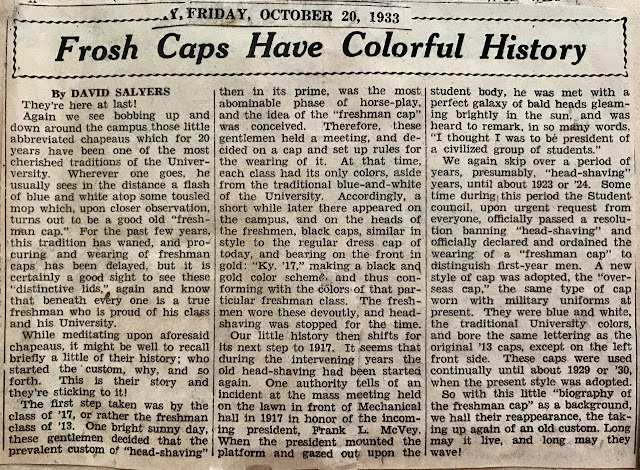 In a few more days the freshies will have to begin wearing their caps and we are so glad, for it makes them look more "authentic." 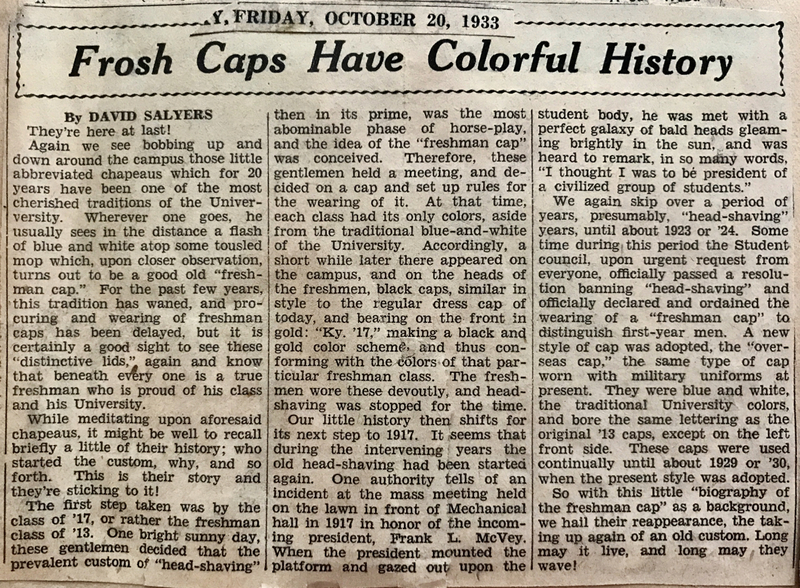 Unfortunately, I have yet to find a photo of David in his freshman cap. I'm sure it was more attractive than a shaved head would have been! as a member of the university's Men's Glee Club, directed by Professor C. A. Lambert. Someone (probably Sarah) marked him with an "x." As in high school, he participated in school drama productions. In his freshman year, he appeared in the university production of "Peter Pan." The following article, apparently from a newspaper in his home town of Carrollton, Ky., brags about him. The next item, the playbill's Cast of Characters, lists David in the starring role. 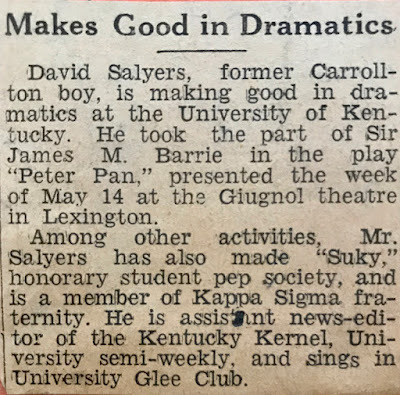 As mentioned in the Carrollton newspaper article, David was also a member of SuKY (an honorary student pep society) and a pledge (and later a full-fledged member) of Kappa Sigma fraternity. 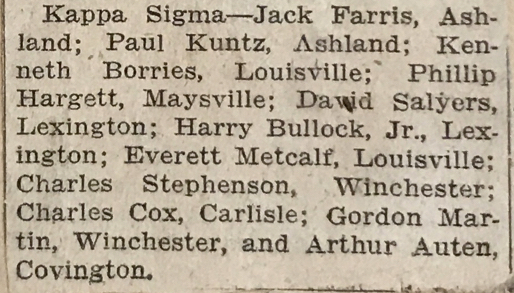 The next clipping from the Kentucky Kernel names members of the chapter's pledge class of 1933. Do you recognize any of your own ancestors on the list? I'm puzzled about the following piece. 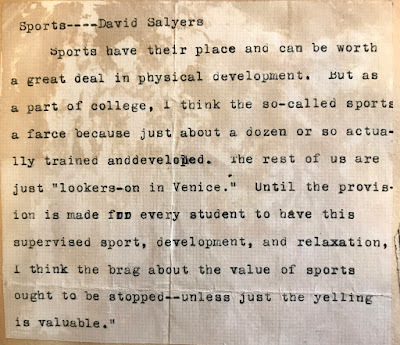 It seems to be an editorial statement that David wrote about college sports. The scrapbooks also mention that David was for at least a semester a member of some sort of military drill corp. So many activities, yet apparently he took a robust academic schedule and made better than average grades. Like his siblings, it seems the busier he was, the higher his achievements. 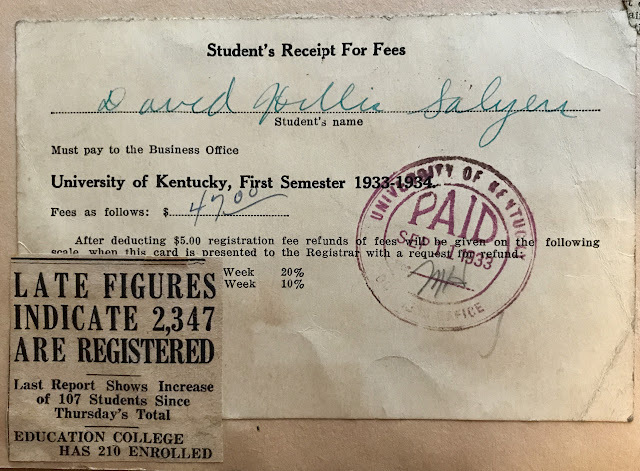 Because it is fascinating to compare costs of times gone by to costs today, I'll close by posting the receipt for David's first semester at UK. His $47 cost for fees in 1933 represents $506 in today's dollars – a 2430.8 percent inflation rate. I don't know what "fees" covered in 1933 and if tuition was included in that category. According to the College Board, the average for tuition and fees at a public, in-state college/university in the 2017-2018 was about $5,000 per semester, so $506 sounds pretty good! Note the headline pasted over one corner of the receipt. Imagine UK with only 2,347 students! Now that we have all four of the Salyers children through high school and into college, I'm hoping readers will guide me on where this blog goes from here. 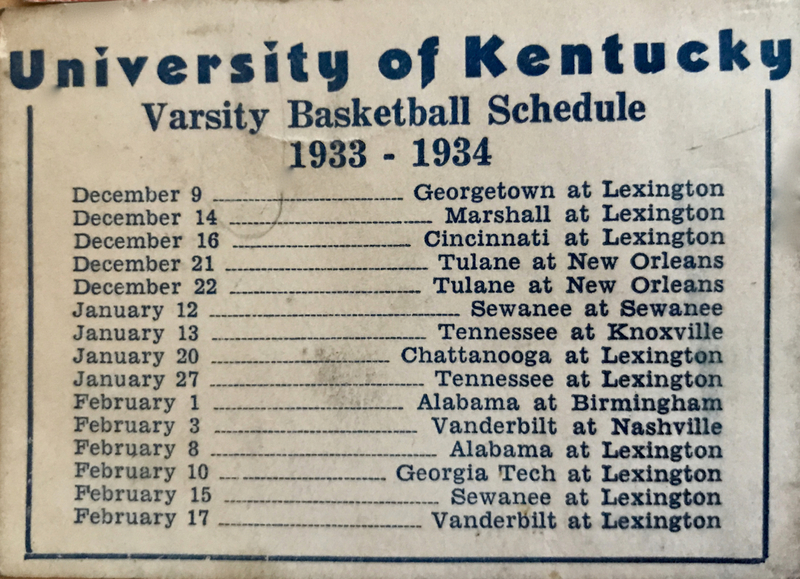 As I mentioned in the previous post, I recently acquired pages and pages written in the 1940s by "The Scrapbooker," Sarah Eva Howe. The pages record her memories of childhood in Carrollton. While I have not yet read this "new" memoir, I anticipate it will build on stories told in the early scrapbooks, adding more names, dates, and places – and adding new stories as well. Where shall we go next, dear reader? Do we continue watching Sarah's four children grow up, get jobs, serve in the military, fall in love, and marry? Or do we double back to pick up Sarah's memories of the 1890s before picking up again where we left off in 1933? I'm eager to hear your opinion. Just click "Post a Comment" below.